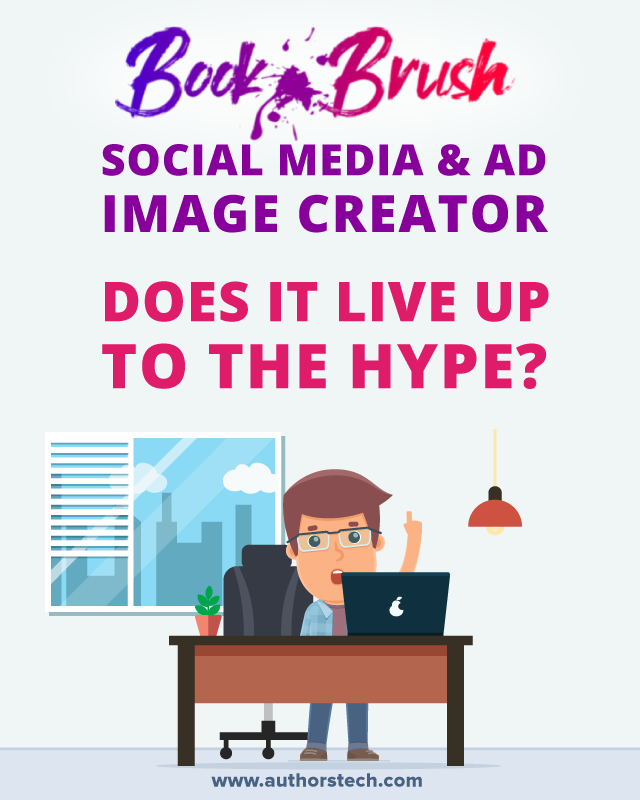 >> Book Brush Social Media & Ad Image Creator: Does It Live Up to the Hype? Extremely intuitive. If you can drag and drop, you can use BookBrush! The graphics it lets you create look polished and pro. Great FB group and community are there to help. As an author, you have a lot on your plate. Outlining books, emailing your list, working on your author site, networking with other authors, planning out your launches, and a million other things. Plus, you have to find time to actually write your books. That's why I'm all about tools that can save you time, especially with stuff you're not so good at. As authors we might be gifted with words, but when it comes to creating appealing images, not so much. That’s why I'm so excited to review this new image creation tool for authors called Book Brush. Let's see how it can help you. Book Brush is an image editing tool that helps you create professional-level ads and social media graphics for your books. You’ll find that other online image editing tools like Canva (although useful) have a very "large" focus. You can create everything from book covers to social media posts, infographics, and virtually every kind of graphic under the sun. But Book Brush is different. It's meant to be used by authors alone. The biggest thing it has going for it is speed. With other tools, you’re looking at a few hours just to complete a design. But, with Book Brush, you can have polished graphics for promotions and social media in a couple of minutes. For authors with little time on their hands, this can be a real blessing. Quickly create 3D book covers by using their template library. Currently, there are over thirty different pre-made templates for you to choose from. Access their library of pre-made templates for BookBub ads, Facebook ads and a lot more. You don’t have to guess about getting the dimensions or structure of your image right. Add video effects to your book's promotional images with the included video creator tool. Access a library of community-created templates for even more choice. Use the included library of over 1 million royalty-free photos and book stamps, like ‘Buy Now at Amazon’. Let's have a look at the most commonly-used features - one by one. The Custom Creator lets you create images and graphics for a wide variety of platforms like Instagram, Pinterest, Facebook, website and banner ads, Amazon, BookBub, and more. You can also create your own custom dimensions for your needs if you’re not choosing from one of the platform-specific templates. The process is incredibly easy and intuitive. It shouldn’t take more than a couple of minutes to have a design you’re happy with. All that you need is a picture of your book cover that you can swap out in the templates section. If you’ve ever tried making a 3D book cover on your own, then you know how much of a headache it can be. I remember spending around 8 hours trying to cobble together a 3D book cover using Photoshop and InDesign (yeah, not fun). With this tool, it’s super easy and took around 2 minutes tops. All you have to do is select your desired 3D cover, then upload the flat image of your book cover. And that’s it! The Video Creator is another cool feature that makes BookBrush a one-of-a-kind tool. In order to make the most of it, you’ll first need to create a 3D image of your book, which you’ll then use to add video and other animation effects. Once you have your image, just search for the type of effect you’d like to add. Then, you can adjust the opacity of the effect, so it blends into or enhances your image. There are tons of different effects that you can choose from. Currently, the animations are simply short video clips, which you can layer behind your images via an opacity layer. It would be nice to have more control over the placement of the videos to create more detailed effects, but maybe more nuanced editing will come in time. It’s still a fun feature to play with and can help to give your covers and book-related images that extra pop. After test driving the tool for a while, Book Brush has a lot going for it and solves a really specific need within the author market. Even if you have no previous design skills, you can create some pretty professional looking graphics using this tool. There’s a solid template library where literally all you have to do is upload your existing book cover and you’ll have a ready to go graphic. The template system makes it easy to implement design best practices without knowing a single thing about design. When you sign up for Book Brush you’ll also get access to a Facebook community filled with like-minded authors. You can post your designs here and get feedback, and see what kind of design’s other authors are coming up with. The Book Brush team is also active in the community and providing feedback and offering design guidance. You can tell that they truly listen to their customers and are continuously improving their service based upon user feedback. As you’re well aware, getting a second set of eyes on your work can be invaluable! One of the biggest reasons to try out this tool is to see just how much time you can save. If you’re wasting countless hours designing your own promotional graphics, images for ads, and graphics for social media, then you should figure out how to take this time back. Book Brush can help. The only thing you need is a completed version of your book cover. Then, you just drag and drop your cover into one of the pre-designed templates and you’re all set. Don't forget you’ll also have access to a stock image library, which can help prevent you from having to go back and forth between a bunch of different tools and websites. Since Book Brush is a relatively new tool you can expect more useful features to roll out in time. We’ve already seen the addition of the video creator and countless other templates. Who knows what else they have in store for the future! As more book advertising platforms become available, you can expect templates for each of these platforms to be added as well. If you’re still not sold on the tool, then you can take advantage of the limited free plan. This basic plan lets you create up to 3 images per month, with a library of 1 million plus background images, and a limited selection of templates, stamps, and fonts. If you only have a book or two to your name, then this free version might be more than enough. Regardless, it’ll give you enough of a feature set to decide if this tool is worth investing in. For starters, this isn’t a cover design tool. You’ll still need to have a completed cover for BookBrush to actually be valuable to you. So, you’ll either need to create one yourself (not recommended) or invest money to have a professional level cover created for your book. Though they have only recently been rolled out, video effects still feel 'incomplete'. The only real thing you can currently accomplish with them is adding background effects to your images. That being said, since it is a new feature, you can expect this portion of the tool become more refined in the future. So, Is Book Brush Right for You? It can be difficult to make the decision to shell out your hard-earned royalties on graphic design work. Maybe you’re already paying for a professionally designed cover, and you don’t want to break the bank on additional design work? Or, maybe you’ve tried designing your own book graphics and ads in the past, and they just don’t look right? Whatever your reason Book Brush is worth giving a test drive. With the limited free plan, you can get started today without even having to enter your credit card details. Just create an account and you can have your first book graphics, 3D cover, or ads created in a few minutes. Then, if you find the tool valuable and want access to more features, you can upgrade to the paid plan. You don’t have to struggle or waste time and money trying to create book ads or book graphics. Give Book Brush a spin, take back your time, and start creating professional book ads and graphics today!